The most basic application is just a user-friendly web-form for searching the VAMP server. This application will be one of the primary deliverables developed and maintained by WP3 Middleware/Core Development, and will have individual interfaces geared to serve the needs of both casual and advanced users. There are, however, far more innovative applications that can use this middleware infrastructure to create new kinds of interactive experiences for virtual explorations of an annotated Universe. This will be made possible by a web query interface that can deliver results directly to web or desktop applications. Here the planned VAMP prototype and pilot applications are described. A museum space or planetarium queuing area could be filled with an interactive exhibit that would make use of tagged data. Multiple video projectors would cover walls with (captioned) imagery culled from VAMP, providing an aesthetic experience that could be passive or interactive — perhaps a touchscreen would allow visitors to direct queries in a specified direction or permit a presentation mode by a museum interpreter. Segues between images could make use of the metadata tagging to show what part of the spectrum the image was taken in or what part of the sky it originated from. 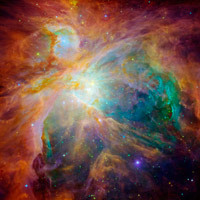 If used in a queuing area, the metadata tags could be selected to coordinate imagery with show topics, so visitors waiting to see a program about star formation would be treated to images of the Orion Nebula, the Eagle, and other HII regions. This prototype application is being managed by Ryan Wyatt at the California Academy of Sciences. Planetariums are increasingly shifting away from static star projection systems in favour of real-time dynamic star position simulations that include 3D representations of the local planet, star and galaxy environments. Potentially this technology can accommodate the integration of up-to-the-minute imagery and media content. A presenter might access VAMP to find the latest observation of a particular object, then automatically show the location of the object on the sky, review the caption to provide useful details about the observation (while the text remained invisible to the audience), and perhaps even ―fly‖ to the location of the object in three-dimensional space. Questions from the audience could be met with an instantaneous response, executing an additional search and culling relevant imagery rapidly and without fear of pulling up inappropriate or irrelevant content (or wasting time on a fruitless search). Importantly, planetarium presenters would have the opportunity to contextualize the latest content with the existing resources at their disposal. VAMP will actively pursue collaboration with the UniView developers to find ways of integrating real-time navigation of content drawn from web assets. UniView is the heart of the Digital Universe planetarium system developed by the American Museum of Natural History. The Digital Universe is used in planetariums around the country which could benefit from the expanded content options offered though VAMP. As part of its ongoing development, VAMP will make the extended planetarium community aware of the potential for collaboration, so integration with other commercial systems, like Evans and Sutherland‘s Digistar 3 system and SkyScan's Digital Sky, is possible as well. This prototype application is being managed by Ryan Wyatt at California Academy of Sciences. Collaborators include Carter Emmart and Brian Abbott of the American Museum of Natural History, SKISS, and Skyskan. A new generation of server-based software giving users access to full-sky imagery at multiple layers of resolution is under current development. The metaphor follows the Google Maps structure of allowing users to zoom in and out of a map, downloading image tiles as needed at whatever resolution is currently being viewed. This provides a user with a rich visual space to navigate by keeping the bulky datasets on web servers and only delivering the data needed for the current view. Two such initiatives that are underway include Google‘s ―Sky in Google Earth‖ and Microsoft‘s ―World Wide Telescope 2.0‖ (WWT). Microsoft has endorsed VAMP and has expressed interest in integrating VAMP infrastructure into the WWT as it becomes available. The vision of the World Wide Telescope 2.0 is to provide a common infrastructure so that multiple surveys, over time, can all share a common intuitive browsing platform that allows for seamless exploration of the universe augmented by the creation of narratives and paths through the virtual sky. Linked contextual narratives will help learners understand what they are seeing as well as connecting them to related deeper information and rich media that can foster a deeper understanding of astronomy and science. Both children and adults who are interested in astronomy but don‘t have a telescope will learn from the linked narratives, understand what they are seeing and go as deep as they choose, exploring the virtual sky and accessing the source data underneath to potentially make discoveries of their own. WWT will enable astronomers, education and public outreach individuals to easily create guided tours through the sky referencing objects in context and benefitting from the common resources and links that WWT will provide. Eventually everyone will be able to create and share their explorations though the virtual sky, thereby extending and empowering an ever-growing audience who want to know more about the Universe. The contextually rich information and media available through the VAMP portal is a natural fit with the WWT structure. Images that have full coordinate metadata can be easily overlaid, registered at the correct positions in the sky and benefit from other WCS location specific information to provide additional contextual information such as captions about the various overlaid views of any object. Curtis Wong of Microsoft Research is the lead collaborator for WWT. Many desktop planetarium packages exist for home users, ranging from open source to affordable commercial projects. Unlike the server-based systems of Microsoft and Google, these dynamically generate sky views from internal star databases, but increasingly they offer image cutout overlays to augment the stellar diagrams. Since most home users are now regularly online, these software packages rely on frequent online updates of satellite ephemeris, comets, asteroids, and the like. In addition, there is limited disk space for installation packages and only hundreds of detailed images, not the thousands that exist today are included in the software for shipment. Therefore, it is not unreasonable that online updates can be used to download and integrate new astronomical imagery seamlessly as it is published by EPO website and consumed by VAMP. Lars Lindberg Christensen (ESA/Hubble) manages this prototype effort. One of the leading planetarium programs in the world, Redshift, produced by Maris Technologies, has endorsed VAMP and is ready to build VAMP access into a future version of Redshift. Similar collaborations are possible with other developers, like Starry Night, as the VAMP infrastructure is put into place and the community is made aware of its potential. 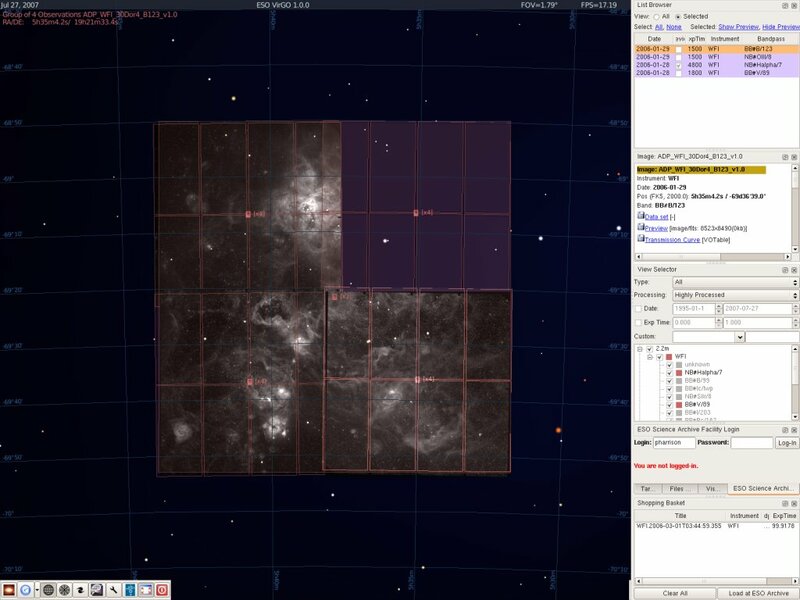 The image shows a screenshot from the community-supported (1 million downloads) desktop planetarium program Stellarium with the new VirGO plug-in. 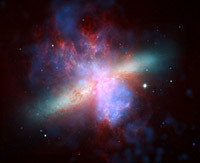 VirGO is developed by ESO's Virtual Observatory Systems department. This prototype will show how Stellarium’s 300 million star sky, seamlessly moved in real-time, is littered with thousands and thousands of ―footprints‖ from real ESO science data, and allows access to associated metadata and science data previews. 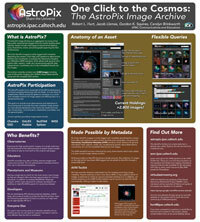 For the well-known deep-sky objects the user will be presented with multiple PR images from multiple sources (i.e. Hubble, Chandra, Spitzer, VLT etc) and access to some of the embedded metadata. The plug-in interfaces with the ESO archive metadata and can show the footprints of thousands upon thousands of imaging datasets on the sky - for instance in a 20x20 degree field - in real time. Imagine Orion littered with little boxes, each signifying a VLT or other observation. The program is vector-based (ie seamless, very fast and smooth). There is also a DSS overlay, although this is fetched in realtime and so is currently limited to one degree squares and less. Some pretty-picture jpg previews are implemented. Anyone can order science data from the archive with one click. Lars Lindberg Christensen (ESA/Hubble) manages this prototype effort. Collaborators include Robert Hurt, Amit Kapadia (ESA/Hubble), Lars Holm Nielsen (ESA/Hubble), and Adrienne Gauthier.